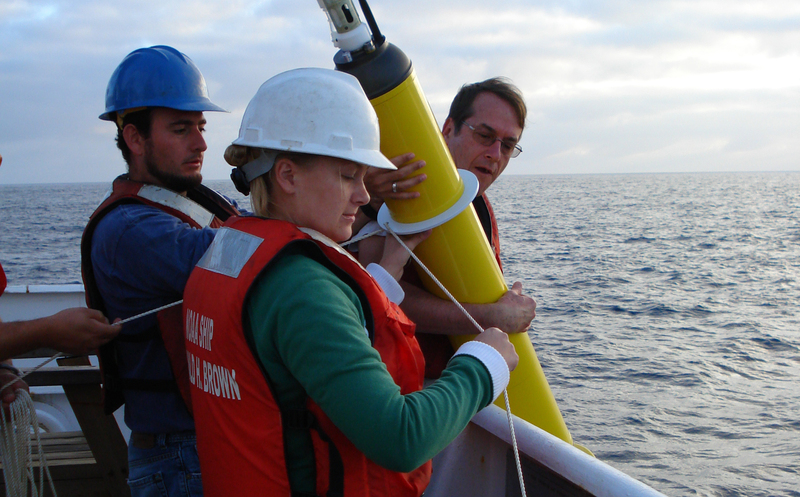 An update to a set of widely used ocean temperature data is now available from NOAA’s NCEI. Along with the public release, an article describing the 5th version of the Extended Reconstructed Sea Surface Temperature (ERSSTv5) dataset has been published in the Journal of Climate. The new ERSST incorporates more comprehensive ocean surface temperature data collected since the last update in 2015. Oceanographers and atmospheric research scientists constitute the major users of the ERSST dataset—a global monthly sea surface temperature analysis. Ocean surface temperatures are an important variable for understanding Earth’s climate. The dataset is used for global climate monitoring and assessment, tracking cycles of the El Niño–Southern Oscillation (ENSO), oceanic and environmental research, and applications in various industries and economic sectors, such as agriculture and water resources. Of the major updates, the inclusion of data from Argo floats is particularly noteworthy because it is the first time the data from this global ocean observational network are included in ERSST. Argo floats normally collect water temperatures from the upper 2,000 meters of the ocean. The floats drift at a fixed pressure then submerge to another pressure and collect data on ascent. Once at the surface, the floats transmit the data via satellites to scientists for processing and analysis. Deploying an Argo float. Courtesy of NOAA Corps. The authors cite another benefit of using Argo: greater coverage. The area monitored by Argo floats has broadened since 1999, such that the number of floats has expanded to make near-global coverage possible today. The floats also provide highly accurate data due to internal and regular quality control processes. This improves the outlook for future long-term monitoring. One important example of how the new dataset will help scientists is in the tracking of El Niño and La Niña cycles, which occur as part of the phenomenon known as the El Niño–Southern Oscillation, or ENSO. ENSO is caused by multiyear shifts in pressure and wind speeds and can have wide impacts on ocean circulation, global weather patterns, and marine ecosystems. “One major improvement in ERSSTv5 is the more realistic spatial structures and magnitudes of the El Niño and La Niña events,” says Dr. Boyin Huang, the lead author of “Extended Reconstructed Sea Surface Temperature version 5 (ERSSTv5): Upgrades, Validations, and Intercomparisons.” Sea surface temperature data are especially useful for identifying the onset of El Niño and La Niña. ERSSTv5 more accurately reflects actual conditions of El Niño and La Niña events at specified locations due to greater accuracy and consistency of observations, as well as adding new criteria that lessen a smoothing effect. 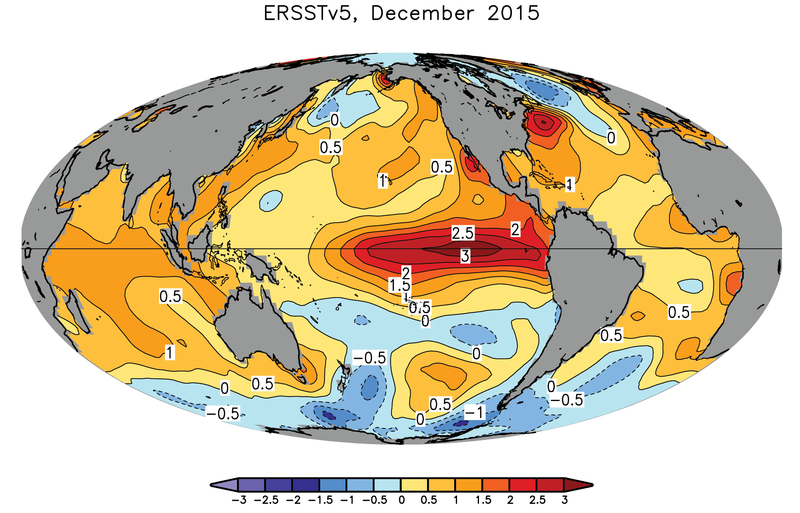 ERSSTv5 SST anomalies show a strong El Niño in the tropical Pacific Ocean in December 2015. Courtesy of NCEI. Climate researchers regularly produce improved datasets that incorporate new data and better methods of interpretation. ERSST users provided invaluable feedback as the dataset was applied to climate research, monitoring, and assessments. To provide quality assurance to the newest version, the research team validated the new ERSSTv5 against other independently available sea surface temperature datasets. These standard methods of review not only encourage scientific advances but are also designed to add public accountability and transparency. To learn more about the operational uses of ERSSTv5, the improvements from version 4 to version 5, and preliminary outcomes of its application, consult our Commonly Asked Questions. Besides NCEI, coauthors are affiliated with the Irish Climate Analysis and Research Units at Maynooth University, Ireland, the Department of Atmospheric and Ocean Science at the University of Maryland, Satellite Climate Studies Branch at NOAA’s Center for Satellite Applications and Research, and the Cooperative Institute for Climate, Earth System Science Interdisciplinary Center, also at the University of Maryland. The Journal of Climate is a publication of the American Meteorological Society. A new study proposes using ocean heat content and sea level rise data to track global warming. A new study about the ocean’s heat content in the journal Science Advances supports evidence of global warming. A team of NOAA researchers took a closer look, literally, at a data-rich region in the Atlantic Ocean to examine ocean phenomena. The Coastal Water Temperature Guide (CWTG) from NCEI supplies recent ocean and Great Lakes temperatures.